Available for purchase at the LoadingReadyRun table in Bandland. Available for $15 each at the Love Has No Labels booth in the Diversity Lounge. Finish the new Love Has No Labels mobile game, League of Extraordinary Humans, to see if you’re a lucky pin winner! The game is available for download on the Apple App Store and Google play. Available for purchase at the Bill Amend table in Bandland. Available for purchase at the Kris Straub table in Bandland. Need to find CC Brigade and purchase a pin! Available for purchase at the Surprise Attack booth #6312. Available at the Phoenix Labs booth #2335 - The demo will feature 3 different, 15-20 minute PvE battles. 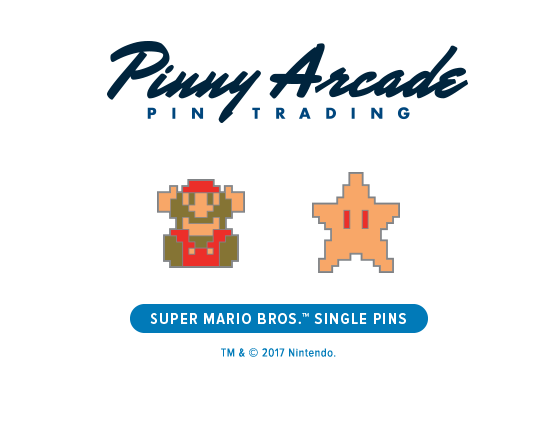 If someone wins the battle they get a pin. Available at the Jackbox Stage. Available for purchase at Katie Rice table in Bandland. Available for purchase at the New Blood Interactive booth #7218 - Play the demo for a pin discount. Available for purchase at the Take This booth in the Diversity Lounge. Available at the Adult Swim Games booth #1933 - Play the ToeJam & Earl: Back in the Groove demo. Grab a Twitch Pin Passport at Twitch Booth Front Desk at Booth 1909. Collect at least two stamps around the Twitch Booth. 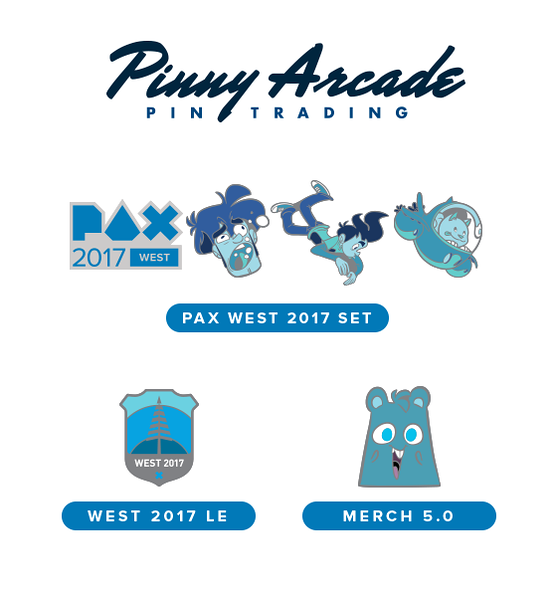 Redeem your Twitch Pinny Arcade Pin at the Twitch Booth Front Desk. Take a photo with the Glitch statue and share on social with the hashtag #TwitchatPAXWest. Meet your favorite streamer at our Meet & Greets. Play Shadowverse at the Cygames Game Zone. Check out new products from the Twitch Demo Zone and Twitch Prime. Limited pins available per day, only while supplies last. One card per person, per day. 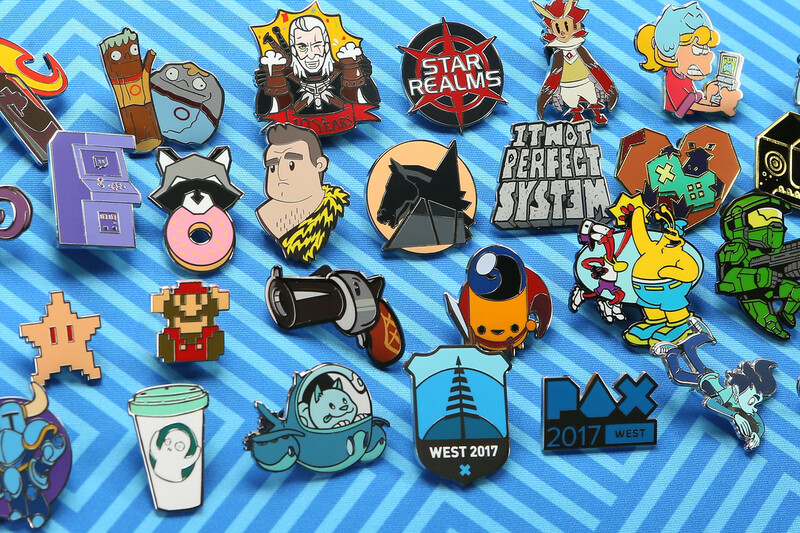 Available at the Ubisoft booth #605 - Reward for high score winners during contests or attendees will be able to get the pin at our panel at the Hydra Theatre that takes place on Saturday from 2:30PM - 3:30PM. Available for purchase at both PAX Merch Booths. ONLY available for purchase at the PAX Merch Lite Booth. Available at both PAX Merch Booths. Available for purchase, for the first time, at both PAX Merch Booths. Available on the Penny Arcade Store on September 13th, 2017. 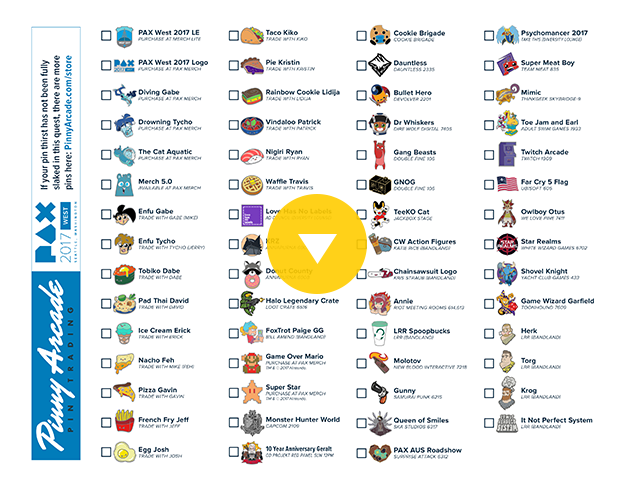 Get your Pin Quest here.